About 7 months ago, we adopted a retired greyhound. She is an amazing dog. She fits in with our family so well. The boys love playing fetch with her and teaching her new tricks. She motivates me to take walks everyday. I wanted to try my hand at making dog treats because, well...she's a little spoiled. I wanted to try making something fun for her and also so I control the ingredients of her treats. 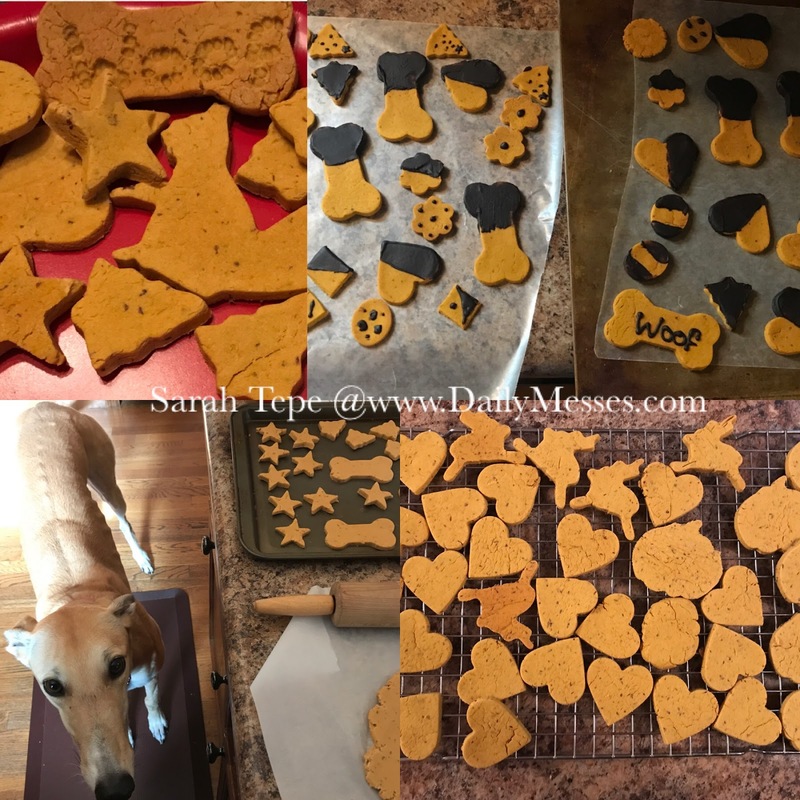 Some of the store bought treats had recalls, some had additives that weren't really good for her, and the grain free treats are more expensive. 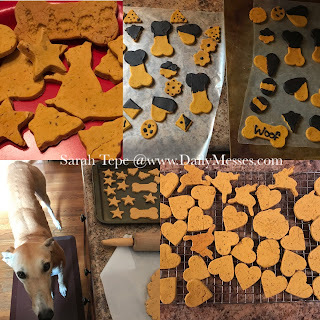 Why grain free treats? Before we adopted her, I did some research on what the best diet/food was for a greyhound. While there were a lot of options, wheat/corn free seemed to be the main consensus (other than continue eating raw). Although diet restrictions aren't completely new to us (our bridge girl could only tolerate eating Iams or she had massive stomach issues), raw was not the way for us to go (for a lot of reasons). So, we decided to go with a mostly wheat/corn free diet. Although her food is grain free, she does occasionally gets treats that are made with flour. After playing around with a few different recipes, I created a peanut butter and pumpkin dog biscuit. It is definitely one of her favorite treats. The recipe is made with brown rice flour, although I have made the recipe with half whole wheat flour and half brown rice flour. I think you could also use all whole wheat flour. They store really well in the freezer (I layer and cover in wax paper in a plastic container). As soon as she hears the freezer open, she now comes running! Because she loved them so much, we made extra batches at Christmas and gave them out to our friends with dogs! 1/2 cup pumpkin puree (not sweetened or seasoned). You can add another 1 teaspoon if the dough is too dry. Roll out. I found it easiest to shape dough into a ball and then roll out on parchment paper. Cut out shapes and place on a cookie sheet. I used all kinds of cookie cutters to make the shapes (rabbit, squirrel, dog bone, heart for Valentine's Day, pumpkin for Halloween/Thanksgiving, star and mini tree for Christmas, oval for Easter eggs, mini flowers for Spring or Easter). Bake at 350 degrees F for 20 minutes. Flip over. Bake another 5-10 minutes or until dry. Cool completely. Store in an airtight container. I like to keep a few out and then freeze the rest. She likes them frozen as well. You can decorate these with carob (while it looks like chocolate, it is not toxic like chocolate is) or yogurt chips. These make cute gifts! I stamped names into the treats before they baked. I also decorated a few with carob. I placed in baggies and gave them out at Christmas. Click here for a PDF printable recipe! NOTE: I'm trying out adding a link for the PDF to make printing easier. Please let me know if it doesn't work and I can try something else!